"This is my new FAVORITE!" When a race says it's flat and fast I get kind of skeptical. I've done races that claimed that but Tobacco Road delivered. There are some hills but you really don't notice them since this is an old railroad bed and railroads like to be as flat as possible. The course started in Thomas Brooks Park and proceeded for about 2 miles on the road before turning on the trail. Both the half and full started at the same time, but once on the trails we were split up until the back half of the full. The aid stations were amazing and everyone was super friendly and cheering. The few road crossing we had on the trail were well managed also. The start/finish area was large and 'T' shaped with the top of the 'T' being the finish corral and port o pots, and the long section the party area. Bag check was super smooth and easy too. Post race food was fruits and water or Gatorade, along with Pizza and chocolate milk and beer of course. At every other maraton I've done the pizza was cold from sitting out, but not this time. It was warm and fresh. Local brewery Appalachain Brewing Company was on hand with different beers and a cider for everyone. I was looking for the PR bell. With a 40 minute PR here I was really looking forward to ringing it, but didn't see one or I just didn't look in the right spot. I never heard one so they may not do that at this event. The expo was nice with a mix of local vendors and area races. And everything was spread out and roomy. If you asked me right now would I come back, my answer would be yes! 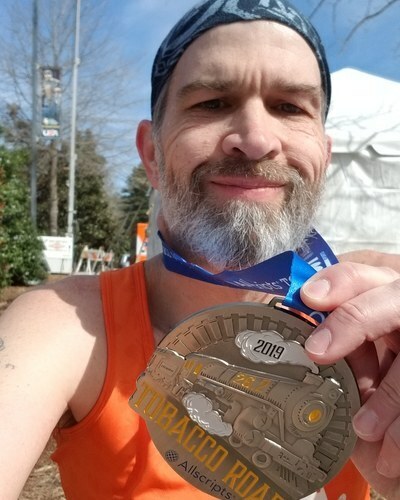 This was a fun event, well managed and ran, and Cary, NC is a beautiful town. I cannot recommend this race enough. "Come out for a great cause and have fun in the process!" This year was my first time hearing about the DAV5k and my first time running in one of their events. The DAV, which is short for Disabled American Veterans, is a support group that helps Veterans and their families. 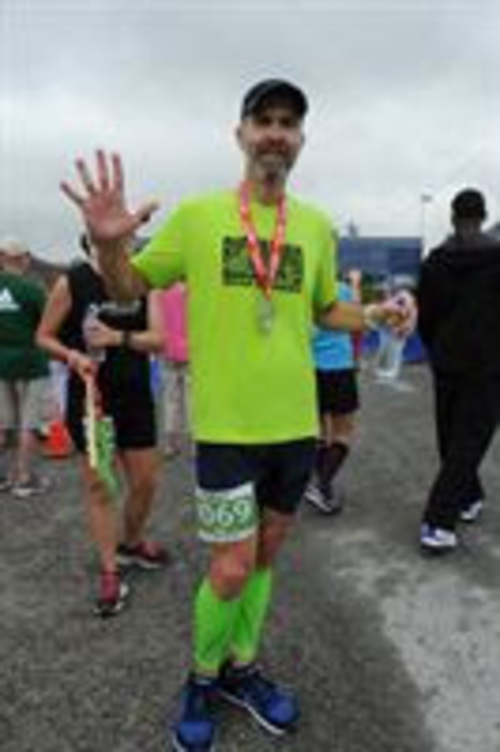 I ran in the Newport News event, which was also a first time running in this city. The course was a loop with 3 Cul de Sac turnarounds and was very flat. To give more to the charity the race is not timed, another first for me so I decided to take my action cam out and record the run. I was also able to talk with several active military men and women that were running and of course we talked about running. Coming from a hilly part of Virginia I thought the flat course was great and would love to run a timed event on it. There was plenty of cheering for everyone crossing the finish and all military persons running receive a medal at the end. Packet Pick up was super fast. You went to one tent and received your bib and a plastic bag, then went to another tent to get your shirt. I usually opt out of the shirt, but I'm glad I didn't this time. It was long sleeved and super soft. There were several event sponsors with tents talking with runners and families and an after race party as well. Over all a super fun race and if they hold one in your area I recommend going. "Freedom's Run is beyond expectations! " It's weird, you go into a race expecting one thing and you get something completely different. With the Freedom's Run Marathon, I'm not sure what I was expecting. The course is absolutely beautiful, you run 10 miles along the C&O Canal Towpath, where the scent of Paw-paws fill the air. The water was a little high due to recent storms, but I'm sure under other circumstances it would be full of kayakers and rafters. There is a hill at mile 15, the director Dr. Mark suggests walking/power hiking it and I agree. It was a steep one, but once you clear that you're running through the rich history of Antietam Battlefield. As you run take a look at the markers pointing out the troop locations, or you want stop and read some of them. After Antietam, you run through Sharpsburg, a nice small mountain town then head back to the river and the finish. The finish, by the way is on the 50 yard line of Shepard's University Stadium. The expo was small and friendly feeling. They don't give you a bag full of flyers, but the groups there have a few if you want more information. Packet pick up was simple, all the races were divided into tables to get your bib and shirt. The University also made the showers at the Wellness Center available for people to use after running, and there's nothing better than a good hot shower, except maybe a massage. And they had those too. There were gels available on the course as well as Gatorade Endurance and water. After the race, everyone was given a reusable bottle so no cups are wasted, and you ate your pizza with your hands, no plates here! I like races that try to cut down on waste and Freedom's Run did it in spades. If you're looking for a fun, friendly marathon with great scenery, and an environmentally conscious plan, then I whole-heartedly recommend Freedom's Run! This was my third time running the Cul de Sac 5k. This is a series of 3 races on Monday nights in July through the Wyndham neighborhood in Richmond, VA. It is also one of the hottest races I've ran as the average temp is around 90, with the 'real feel' possibly in the 100's. Packet pick up is before each race and if you run all 3 they hand out something. The first year I ran it was a towel, the next time it was a medal, and this year it was a hat. I like that they don't do shirts as I don't really want a shirt anymore from a race. On the last night they have pizza for everyone and one of the sponsors had Popsicles they handed out. The course follows the road around the school and dips in and out of 3 Cul de Sacs before completing the loop back to the school and the finish. One neat thing is they add up points form all 3 races to determine age group and top finishers, so you can mess up one week and come back strong the next. This series is also a good way to see the effects of temperature and how it affects your running. The first week was the hottest and also my worst time, while the second was the coolest and my best finish. There are usually 2 to 3 water stops along the course and some of the homes will be out with sprinklers hosing you down if you want it. This is a run series and I'm looking forward to next year. So I signed up for this in November of 2017 thinking it was at night and a half marathon in Virginia in June is no problem. Yeah right. Temps at the start were around 92 with no wind. It was going to be brutal. I arrived in Farmville around 4pm and found a place to park. There's plenty of public lots in town so that was easy. Packet pick up was easy and quick with multiple lines based on preregister and walk up and the staff were super efficient. Before the race we had a few words about the course and what to expect for the half and ultra runners, then everyone lined up at the start at the trail head. The course is on the High Bridge trail, an old railroad bed that has been converted into a trail system and runs through High Bridge Park. The course was flat with few road crossing and crossing High Bridge over the Appomattox River is pretty awesome. The half marathon was out and back, simple enough, and the ultra runners went out further then came back and went out in the opposite direction at the start. The aid stations were well stocked with the usually ultra goodies, pretzels, fruit, soda and water. Due to the heat they set up extra unmanned stops to refill water bottles which was great. The director sent out an email advising everyone to carry water, and if you didn't have a handheld or pack on it would be an automatic DNF. I have to appreciate a group that thinks about the runner safety that way. Overall this was a simple low key event. No Expo, no fancy sponsors, just a group of people getting together on a hot summers night to run on the trails. And for that reason I would recommend this race, and I may try the ultra next year. As flat and easy as the course is it would be a good course to try for your first time.